SEOUL, Aug. 27 (Yonhap) — The suspected massive opinion rigging led by a political blogger was ultimately aimed at influencing public sentiment in favor of the now-ruling Democratic Party in the run-up to last year’s presidential election, special prosecutors said Monday. Special counsel Huh Ik-bum announced the result of the 60-day investigation into the alleged manipulation of online comments by the blogger Kim Dong-won, known as Druking, and his crew, which also implicated South Gyeongsang Province Gov. Kim Kyoung-soo as a possible co-conspirator. The team of 87 investigators was launched on June 27 upon the National Assembly’s passage of a bill on the independent probe. Suspicions have centered on Druking and Gov. Kim, then a ruling DP lawmaker, for allegedly working together to jack up “like” clicks for comments on Internet news articles to benefit the DP beginning in November 2016 and in the lead-up to the 2017 presidential election. The then-DP front-runner Moon Jae-in won the snap election in May, which came after his predecessor Park Geun-hye’s ousting from office by the Constitutional Court over an influence-peddling scandal. Special prosecutors concluded that Kim showed the governor a prototype of a computer program designed to manipulate Internet comments in early November 2016 and gained his approval to carry out the scheme. 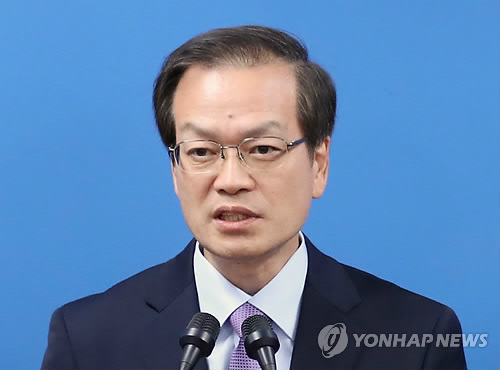 In a press briefing on Monday, Huh said Druking had his team “speed up” the process for developing the computer program, since a snap election was becoming more likely given political movements toward Park’s impeachment. Druking and his crew ran the program to rig comments on 1,154 cases at the start in December 2016. The figure spiked to a whopping 7.48 million by May last year, an indication that they effectively tried to influence the vote by tampering with news comments, according to the special prosecution. “We will make sure these allegations will be proven true in court through the evidence we’ll present,” he told reporters. Prosecutors will follow up on the investigation into two sitting presidential officials — Song In-bae and Baek Won-woo — over their alleged roles in the opinion rigging, Huh said. Song is accused of taking bribes from Druking’s association, and Baek is suspected of trying to cover up the scandal. Gov. Kim rejected any involvement in the online opinion rigging and conspiring with the online bloggers. On Friday, the special counsel indicted both Kims and eight others for their suspected involvement in the alleged operations. Gov. Kim faces charges of violating the national election law by proposing a job to one of Druking’s close associates in return for carrying out the illicit cyberoperations. Huh’s team has faced criticism that they are not doing enough to crack the case because the probe is targeting Gov. Kim, a potential presidential candidate who is known for his close ties to President Moon. Huh sought an arrest warrant for Kim earlier this month, but the court turned it down citing a lack of reasons for it. The suicide of Rep. Roh Hoe-chan, a veteran politician from a minor progressive party, over his alleged connection to Druking is seen as another factor that has affected the probe. Early last week, the team decided not to seek an extension of the probe as they did not see a need for additional investigation. It is the first time since the independent counsel system was introduced in the late 1990s that a special prosecutor has decided not to use up the maximum period of investigation.